Since Bertie County is located near the Outer Banks, local folks really enjoy their shrimp boils and oyster roasts. We have created a lip-smacking, fingerlicking peanut that is flavored with our special Outer Banks Style Seafood Seasoning. Give them a try, we know you will love 'em! These are great! the seasoning is perfect. The nuts crisp and delicious. At first I thought these were too salty, but that opinion disappeared as quickly as the peanuts. I will buy the larger size next time. Two of them. I ordered these as a last-minute gift the week before Christmas. Delivery was speedy and on-time as promised! The flavor was extraordinary! We passed the container around and they were gone in no time. Everyone wanted to know where I found these nuts. We'll be back! Excellent seasoning and always fresh. Ordered three jars recently. Fresh peanuts with a great seasoning. Will definitely order more! Batchelor Bay peanuts are perfectly seasoned, with just the right spiciness and saltiness, and a satisfying crunch. I have tried all the seasoned nuts except Weeping Mary and liked them all. Not too hot to eat and well seasoned. Yum, I can't stop eating them! 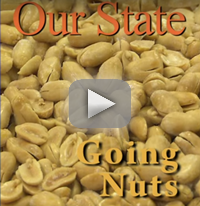 The flavors in these nuts are exciting & different from what I expected - even better! I really want some more right now...! We purchased our first jar of these peanuts at the shop in Windsor last summer. Since then we have shared our discovery with many friends, and all are enthusiastic about the flavor and freshness. We plan to use our present supply of jars as stocking stuffers for Christmas. This company has the biggest and best tasting peanuts EVER!! 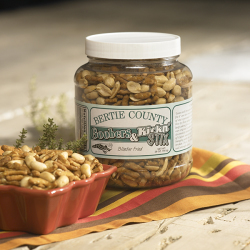 Bertie County Batchelor Bay Seasoned Peanuts have a one-of-a-kind, distinctive flavor. They have become a tradition for us. My order came in on time and they were dellicious as usual. My friend were glad I again gave them Bertie County Peanuts for presents. These remind you of being at a seaside restaurant, like Old Bay Seasoning. Very Good! I've received the Batchelor Bay spicy peanuts numerous times and found them to be fresh and flavorful with a lot of spice. This time, though, the spice is lacking almost to the point that the order is just simply plain peanuts which I didn't want. So I'm very disappointed. 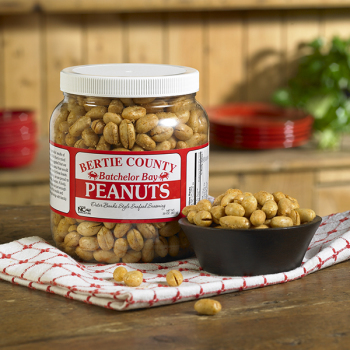 BERTIE COUNTY PEANUTS ARE THE BEST AROUND. WONDERFUL FLAVOR IN EACH BATCH! all the peanuts sent to me were wonderful!!! I love these peanuts. I have a hard time choosing between these and the Salt and Pepper. We love Bertie County Peanuts. My wife's favorite are Bachelor Bays. Mine are the Weeping Mary's, hot and spicy. My daughter loves the Wasabi peanuts. I love really love them all. The peanuts are large and very, very tasty. Not only does North Carolina have the greatest BBQ ever, but now I've discovered their peanuts! Bertie County Peanuts with Batchelor Bay Seasoning are out of this world! The peanuts are fresh and flavorful, and that seasoning is something very special. You got me -- I'm hooked! Best peanuts hands down an fast shipping!! 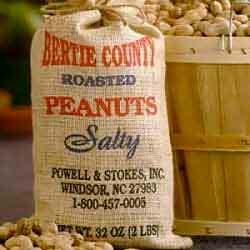 Batchelor Bay peanuts from Bertie Co. are our favorite product from Bertie Co. peanuts. It is a perfect seasoning blend. Not too much salt, but enough to make the spice blend stand out! We've tried most of the Bertie County peanuts and definitely like the Bachelor Bay flavor the best. Our relatives in Ohio ask for these every year for Christmas treats. Good job on developing such an excellent product! I've been buying the Batchelor Bay seasoned peanuts for several years. I buy them for myself, & I buy them for gifts. They are without a doubt the best peanuts ever! Everyone I've ever given them to wants to know where I got them & how they can get some too. The seasoning definitely reminds you of a beachside shrimp boil. I'll continue giving these as gifts so that everyone knows that North Carolina is the best! Being raised in Southampton County Virginia on a 300 acre peanut farm, eating raw peanuts out of a drying trailer, as well having several companies upstart in the area cooking peanuts, I must say you guys are doing a great job. I order from some of the locals still, but I, along with my family members purchase these as well as some of your others every year. The crunch and the hint of spices is really a hit with me and my family coming from an area that saw the upstart of frying peanuts. Keep up the great work!! I bought some of these at the Christmas show in Greenville. My husband loved them and kept asking where to get more. So I had to order some. And he has already finished one of them! Did not realize I was buying the Seasoned Peanuts, Thought I was purchasing the Blistered Fried Peanuts, labels look too similar. They are ok but not as delicious as your Blistered Peanuts! Batchelor Bay peanuts are delish!